Happy New Year! Gosh, keeping the blog updated has taken a backseat to life recently. We had a busy and fun Christmas break, entertaining a total of 72 friends and family at different times during the twelve days we had off from school. I’m amazed at how fast the month of January has flown – they say “time flies when you’re having fun”… This semester, I’m teaching Entrepreneurhip, Experiential Tourism Products and Services, Into Psychology, and Intro Sociology at the Pictou Campus of the Nova Scotia Community College; while D’Arcy continues to teach Grade 6 at a school not far from mine. The boys are curling every day after school, and at least one day on the weekend. They are heading “South” to Yarmouth tomorrow for their first Canada Winter Games (2015) qualifier. The tournament is double-knockout and the top two teams will automatically move forward to next year. The “mate” or “third” of their team is from Yarmouth, so the boys and their coach will be staying at their house, for which we are very grateful. I spent last weekend cooking and baking, to send some food along (the least we can do): lasagna, chilli, homemade macaroni & cheese, four loaves of bread, blueberry muffins, and homemade granola bars. 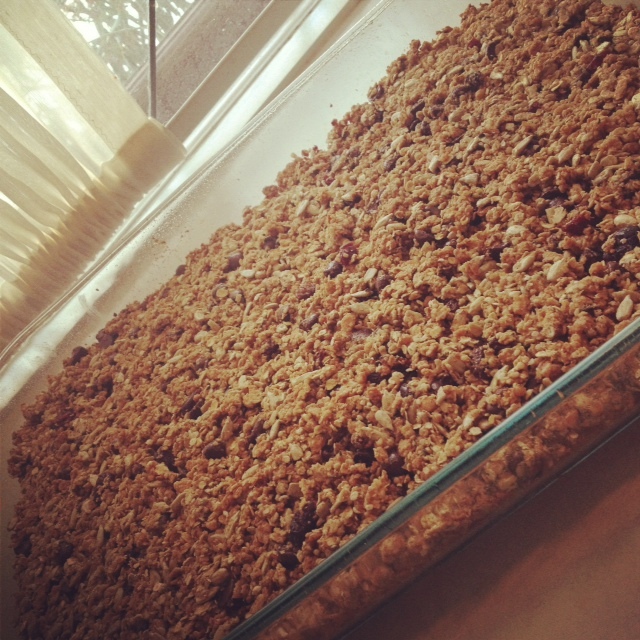 I posted a photo of the granola bars on my personal Facebook page and got such a response of friends looking for the recipe, that I decided to post it here for more people to enjoy! I must begin with the caveat that each time I make these, they are slightly different, depending on what ingredients I have on hand. Although they are not gluten free, they are peanut, tree nut, egg, and soy free. (Dairy free too if you omit chocolate chips, or use Enjoy Life or Divvies brand chocolate chips.) I hope if you try them, you will enjoy! Other suggestions would be to add flax (I was out), coconut, dates, or any other dried fruit. Mixture will be crumbly. Press into a well-greased 11×13 pan. Bake in 375*F oven for 20 minutes or until edges are browned. Cut while still warm, or they become difficult to cut through. This bars have quickly become a lunchtime or snack favourite in our household and the bonus is that they are economical, allergy-free, and litter-less!